Objective The future promises many technological advances in the field of heart valve interventions, like tissue-engineered heart valves (TEHV). Prior to introduction in clinical practice, it is essential to perform early health technology assessment. We aim to develop a conceptual model (CM) that can be used to investigate the performance and costs requirements for TEHV to become cost-effective. Methods After scoping the decision problem, a workgroup developed the draft CM based on clinical guidelines. This model was compared with existing models for cost-effectiveness of heart valve interventions, identified by systematic literature search. Next, it was discussed with a Delphi panel of cardiothoracic surgeons, cardiologists and a biomedical scientist (n=10). Results The CM starts with the valve implantation. If patients survive the intervention, they can remain alive without complications, die from non-valve-related causes or experience a valve-related event. The events are separated in early and late events. After surviving an event, patients can experience another event or die due to non-valve-related causes. Predictors will include age, gender, NYHA class, left ventricular function and diabetes. Costs and quality adjusted life years are to be attached to health conditions to estimate long-term costs and health outcomes. Conclusions We developed a CM that will serve as foundation of a decision-analytic model that can estimate the potential cost-effectiveness of TEHV in early development stages. This supports developers in deciding about further development of TEHV and identifies promising interventions that may result in faster take-up in clinical practice by clinicians and reimbursement by payers. Emerging technological advances in the field of heart valve interventions are often accompanied with high research and development costs. To avoid unsuccessful implementation of new technologies in clinical practice, it is essential to investigate the potential cost-effectiveness of new technologies before implementation in clinical practice using early health technology assessment (HTA) techniques. Early HTA investigating particular requirements for novel heart valve interventions to become cost-effective in the future is not yet available. An example of an emerging technological advance is tissue-engineered heart valves. In situ tissue engineering provides a promising method to create heart valves with potential to grow, repair and last a lifetime. They have the potential to limit or perhaps even eliminate the disadvantages of existing heart valve substitutes (eg, use of anticoagulation drugs and need for reoperations because of valve degeneration). The paper provides a conceptual model (CM) to study the cost-effectiveness of currently available heart valve interventions and novel heart valve interventions, such as tissue-engineered heart valves. Based on the CM, we can build a decision-analytic model to inform stakeholders about the cost-effectiveness of current heart valve interventions and the potential cost-effectiveness of novel heart valve interventions. The results of this early HTA will especially be useful for the developers of tissue-engineered heart valves because it can guide them in further development of the interventions. However, it also helps clinicians and healthcare payers in identifying promising applications of tissue-engineered heart valves, which may results in faster take-up in clinical practice and reimbursement by healthcare payers. This research is part of the Netherlands Cardio Vascular Research Initiative (CVON) 1Valve consortium that aims to develop the first in-human tissue-engineered heart valves. To support the developers in the development of tissue-engineered heart valves, we are in the process of developing a decision-analytic model for the early HTA of tissue-engineered heart valves. In a decision-analytic model evidence from different sources on health outcomes, health-related quality of life and societal costs can be combined. The appropriate development of a decision-analytic model begins with understanding the problem that is being represented by defining a conceptual model (CM).9 This study describes the process of developing the CM for early HTA novel heart valve interventions, especially tissue-engineered heart valves. 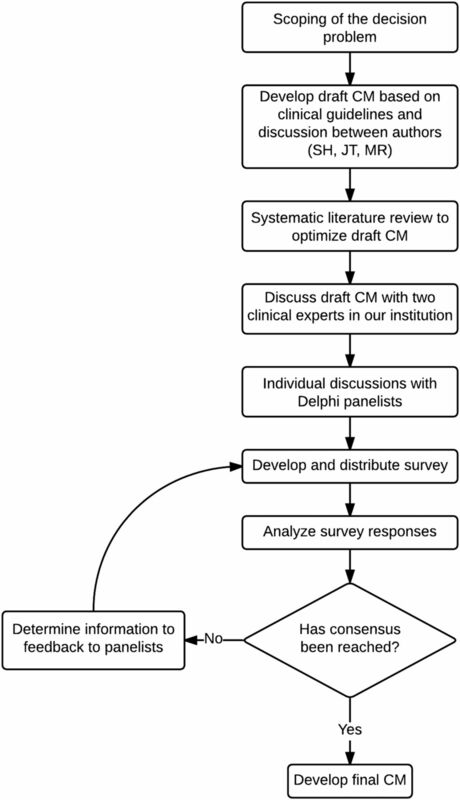 The development of the CM was based on recommendations from ISPOR-SMDM Modeling Good Research Practices Task Force-2.9 Figure 1 provides a schematic overview of the CM development process described in this paper. First, we scoped the decision problem and developed a draft CM. Next, we performed a systematic literature review to compare the structure of the draft CM with existing decision-analytic models. Finally, we organised a Delphi panel to validate the CM with experts and finalise the model. Schematic overview of the development process of the CM. CM: conceptual model. The complete methods of the systematic review of existing decision-analytic models on the cost-effectiveness of heart valve interventions will be reported elsewhere. In short, in May 2015, several databases were searched using key words regarding economic evaluations, models, heart valve disease and implantations. Publications were included when they reported model-based economic evaluations considering costs and health outcomes of heart valve implantations. Papers solely describing regression models, cost analyses, non-English publications, conference proceedings or abstracts, editorials and letters to the editor were excluded. References of the selected papers and previous systematic reviews were crosschecked for other relevant studies. For the purpose of the development of the CM, study and model characteristics of included studies were extracted. Study characteristics included target population, patient characteristics, valve position, intervention of interest and comparator(s), location (ie, country) and study perspective. Model characteristics included the type of decision-analytic model, model health states, health outcomes, time horizon, cycle length (in Markov models) and discount rates. Additionally, we extracted cost-effectiveness results and critically appraised the methodological quality of the studies, but these results will be reported elsewhere. To assess whether the events and treatment options in the model represents clinical practice, we presented the CM to experts. This process was divided into two parts. First, we discussed the draft CM with a cardiothoracic surgeon and intervention cardiologist in our hospital. The following topics were discussed: general understanding and completeness of the model, overlap between model elements, consideration of valve-related events on the short and/or long term and combining valve-related events in composite events. Afterwards, we adapted the structure of the model based on the input of the experts. Second, we gathered opinions of eight other experts from our (n=4) and other hospitals in the Netherlands (n=4) using a Delphi panel.12 Altogether, the Delphi panel consisted of 10 panellists: 5 cardiothoracic surgeons, 4 cardiologists and 1 biomedical scientist. In the first round of the Delphi panel, we held individual semistructured interviews with the panellists to explain the structure of the model, to discuss the events included in the model and their typical treatment options, and to discuss topics that emerged as a result of our systematic literature review. After the experts were interviewed, we converted the collected information into an online questionnaire. The first questionnaire asked panellists about their opinion on topics other panellists brought up during the interviews. Based on the results of the first questionnaire, we have sent the panellists a second online questionnaire with an updated CM with explanation of the adaptions that were made. This round provided a final opportunity for the Delphi panellists to give suggestions about the CM. The patient population of interest includes patients with severe valve stenosis or regurgitation in the aortic or pulmonary position that are deemed candidates for surgical valve replacement or transcatheter valve implantation. We focus on the aortic and pulmonary position because tissue-engineered heart valves are expected to be implanted in these valve positions in the near future. The current treatment options are defined as surgical valve replacement and transcatheter valve implantation in the aortic or pulmonary valve position. To limit the complexity of the model and data requirements, valve repairs are not taken into account. We chose a societal perspective, which means that all relevant costs and benefits are to be taken into account regardless of who bears the costs or enjoys the benefits.16 The outcome measures were defined as health-related quality of life, event occurrence, event-free survival, valve-related and non-valve-related mortality and societal costs. We decided to adopt a lifetime horizon, modelling outcomes from the start of the intervention until the patient dies. Draft simple CM for the early HTA of tissue-engineered heart valves. CM: conceptual model; HTA: health technology assessment. Draft detailed CM for the early HTA of current and novel heart valve interventions. *Within 30 days after the intervention. CM: conceptual model; HTA: health technology assessment. The model starts with the valve implantation. Patients can survive the intervention or not. When patients survive the intervention, they can remain ‘alive’, die from non-valve-related causes or experience a valve-related event. Patients experiencing an event can die without receiving treatment or receive treatment for the event. After treatment patients can die or survive the event. When patients survive the event, they can stay alive, experience another event or die due to non-valve-related causes. The quality of life and costs of being alive after an event depend on the experienced event. The transition probabilities of patients moving from one health condition to another depend on predictors. Figure 3 provides a detailed explication of the same CM as presented in figure 2. 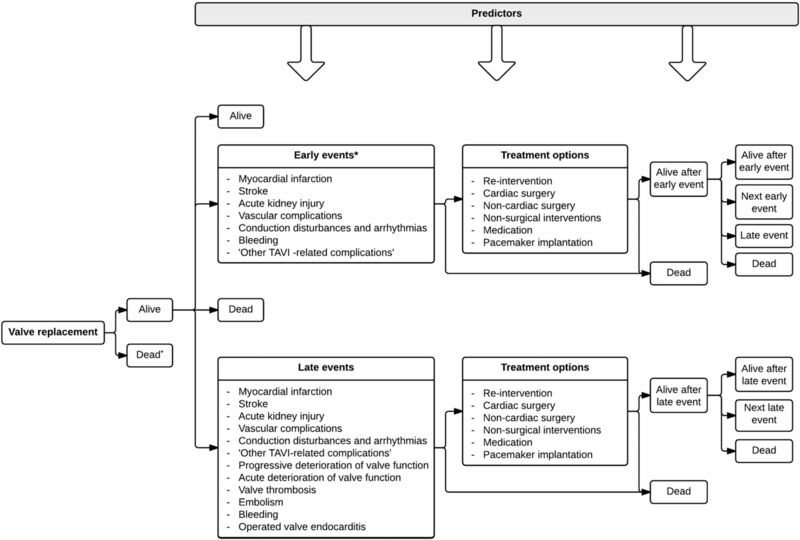 In figure 3 the valve-related events and treatment options are specified and the events are divided into early (<30 days after the intervention) and late events. The definitions of these events are based on clinical outcome reporting guidelines.18 ,19 Some events are more common in patients undergoing transcatheter valve implantation than surgical valve replacement and vice versa. However, to be able to compare interventions, all events are to be included for every intervention. The systematic literature review identified 14 studies reporting decision-analytic models for economic evaluation of heart valve implantations.20–33 The following elements in the structures of existing models were remarkable and were discussed with the experts to determine whether and how these elements should be operationalised in our model. 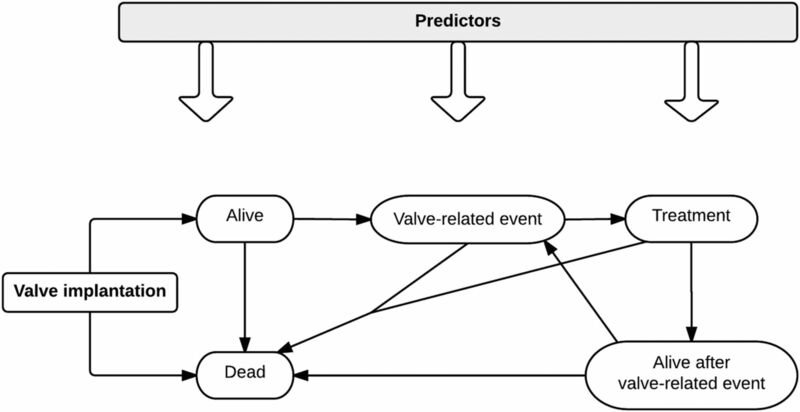 First, in the existing models, the events are not as detailed as in our model; when complications are included several valve-related events are combined or less valve-related events are included. Second, the events that are included in the short-term or long-term differ between studies. Third, conversion to surgical aortic valve replacement is sometimes included as option in models considering TAVI. The input from the first two experts resulted in an updated model illustrated in online supplementary appendix figure 1. Subsequently, we recruited eight additional experts resulting in a Delphi panel with 10 panellists. The updated CM was discussed with seven of the eight panellists during semistructured interviews. After the interviews, two rounds of online questionnaires were send out to all 10 panellists. The first questionnaire was answered by eight panellists and the second questionnaire by 10 panellists. The results of the input from the first two experts and the Delphi panel are described in detail in online supplementary appendix 2. The following describes the most important changes that were made based on the expert's opinions to obtain the final CM (figure 4). The events are separated into cardiovascular, non-cardiovascular and prosthetic valve-related events to obtain a logic model structure. 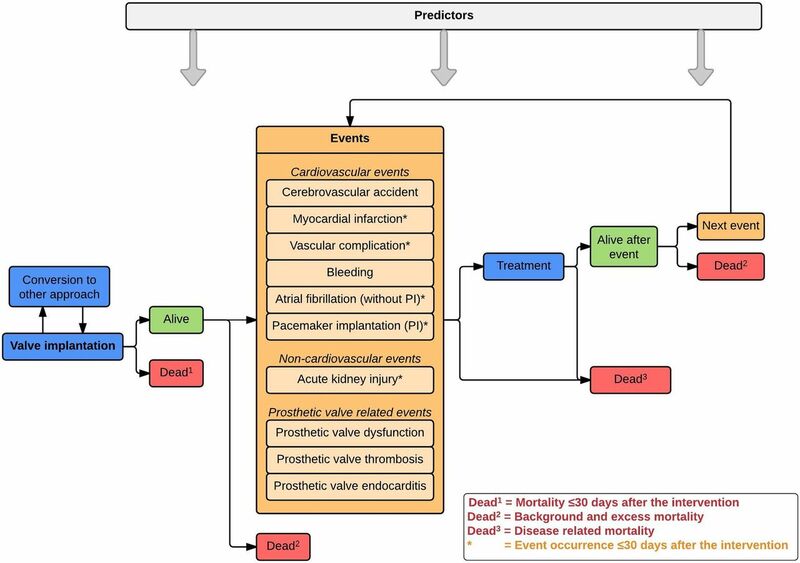 All events in the model are related to the heart valve intervention, but the events in the category ‘prosthetic valve-related events’ are directly related to the heart valve substitute. The following events are considered only during the first 30 days after the intervention because after that period the events are not necessarily related to the intervention: myocardial infarction, vascular complications, atrial fibrillation, pacemaker implantation and acute kidney injury. The other events are to be considered during the rest of the patient's lifetime using time-to-event rates. The event ‘stroke’ is redefined as ‘cerebrovascular accident’ to include strokes and transient ischaemic attacks. Except for atrial fibrillation during the first 30 days after the intervention, conduction disturbances and arrhythmias are only included in the model when they result in pacemaker implantation. Otherwise these events were considered less relevant. The distinction between acute and progressive deterioration of valve function was found to be unrealistic because the (changes in) the rate of deterioration can often not be established in clinical practice. Therefore, these events are combined into one event called ‘prosthetic valve dysfunction’, including structural valve deterioration, non-structural valve dysfunction and valve malpositioning. Instead of the general term ‘embolism’ two severe consequences of embolism—stroke and myocardial infarction—are included in the model to avoid double counting of events. Conversions from transcatheter valve implantation to open surgery and vice versa are added to the model. The group of events ‘Other TAVI-related complications’ is excluded from the model as a separate category. Instead, these events are included in other categories of events or excluded (see online supplementary appendix 2 for more details). Final CM for the early HTA of current and novel heart valve interventions. Cerebrovascular accident includes strokes and transient ischemic attacks. Prosthetic valve dysfunction includes structural valve deterioration (SVD), non-structural valve dysfunction (NSD) and valve-malpositioning. Treatment includes the typical treatment strategies for the events in the model (table 1). Background and excess mortality: Some of the non-valve-related mortality will be comparable with mortality in the general population (background mortality). The remaining non-valve-related mortality can be ascribed to the excess risk of dying of patients who underwent heart valve interventions (excess mortality). The excess mortality can be explained by increased occurrence of sudden death, underreporting of valve-related events, and underlying pathology such as left ventricular hypertrophy. CM: conceptual model; HTA: health technology assessment. In addition to inclusion of events in the CM, the typical treatment strategies for the events were discussed with the Delphi panellists. Based on their advice, we included the most common treatment options presented in table 1. This study provided a CM to perform early HTA of tissue-engineered heart valves expected to be used in clinical practice in the future. By using a comprehensive approach, including a systematic literature review and input from a Delphi panel with experts, the CM developed in this study has become a valuable representation of the most important consequences after heart valve interventions. The CM serves as the foundation of the decision-analytic model that will be used to perform early HTA of tissue-engineered heart valves. Although the model is developed for tissue-engineered heart valves, it can also be applied to estimate the cost-effectiveness of currently used heart valve interventions and other novel heart valve interventions such as minimally invasive valve surgery and robotically assisted valve surgery. Before we can perform cost-effectiveness analyses with our decision-analytic model, data need to be collected on the input parameters of the model. Three types of input parameters can be distinguished: (1) time spent in health states and transition probabilities (chance of moving from one health state to another), (2) quality of life weights and (3) societal costs of patients, in every health state in the CM. In early HTA, the interventions under study are not used in clinical practice yet. Therefore, we will need to make assumptions about the input parameters for tissue-engineered heart valves. These assumptions will be based on the results of animal studies and expert opinion of biomedical scientists developing tissue-engineered heart valves and clinicians. The accompanying uncertainty of these assumptions will be analysed using exploratory sensitivity and scenario analyses. In contrast to tissue-engineered heart valves, the input parameters for the current standard of care can be based on real-world evidence. Time spent in health states and transition probabilities will be based on clinical data registries and systematic reviews and meta-analysis.34 Healthcare costs are currently being estimated using claims data from health insurers. Quality of life and costs outside of healthcare (ie, productivity and informal care costs) are collected using patient-reported questionnaires. Once the input parameters are collected, we can use our decision-analytic model to perform the following analyses. First, the cost-effectiveness of currently used heart valve substitutes can be determined. Second, a benchmark can be set for the minimum performance requirements and maximum costs of tissue-engineered heart valves to be cost-effective compared to currently used heart valve substitutes. If it is not likely that the performance requirements will be met or when the costs of the new intervention appear to be too high compared to currently used heart valve substitutes, continuing investment in tissue-engineered heart valves may not be worthwhile. Third, when it seems feasible to meet the performance requirements and implant tissue-engineered heart valves under the maximum allowed costs to be cost-effective, more detailed cost-effectiveness analyses can be performed by simulating various scenarios with the decision-analytic model. In these scenarios, the impact of different assumptions on the performance and costs on the cost-effectiveness of tissue-engineered heart valves can be simulated. These scenario analyses can be modified and repeated as more information becomes available during the development process of tissue-engineered heart valves. Fourth, we can also use our decision-analytic model to determine the probabilities and size of return on investments of developers of tissue-engineered heart valves. The potential revenue can be calculated by multiplying the difference in the proposed sales price and expected production costs of tissue-engineered heart valves with the expected number of patients per year.35 Relevant scenarios with different estimates of the sales price, production costs, number of patients per year and speed of adoption of the novel heart valve intervention can be simulated. Finally, a budget impact analysis can be performed to address the expected changes in the expenditure of the national healthcare system after the adoption of the new heart valve intervention. These analyses can inform healthcare decision makers and health insurers about potential financial consequences. Despite the potentials of (early) HTA, there are also limitations. First, all models represent a simplification of reality. Therefore, decisions had to be made about what is relevant to include. This study enables readers to gain insight in the choices that were made and the reasons for making simplifying assumptions when necessary. Second, there were some events for which consensus could not be reached within the Delphi panel: including transient ischaemic attacks in addition to stroke, excluding or including atrial fibrillation during the first 30 days after the intervention and including myocardial infarction and pacemaker implantation during the first 30 days after the intervention instead of over the patient's lifetime. In these cases, the small workgroup (SH, MR, JT) decided about the inclusion of these events. However, these decisions may alter the results of the model.9 In case sufficient data are available, we can perform sensitivity analysis for these events to determine their influence on the outcomes. Third, although most panellists initially did not agree, we had to decide to model the various types of prosthetic valve dysfunction in the same way because it is not feasible to incorporate different rates of deterioration of quality of life because of limited data availability. However, the majority of the panellists did not object to this decision in the final questionnaire. The future promises many emerging technologies in the field of heart valve interventions. Prior to implementation in clinical practice it is essential to perform early HTA to inform stakeholders about the potential return on investment and societal impact of the new technology. In this study we developed a CM that will be used as the foundation of a decision-analytic model that can estimate the cost-effectiveness of current heart valve interventions and the potential cost-effectiveness of novel heart valve interventions in the early development stages, especially tissue-engineered heart valves. The results of this early HTA will especially be useful for the developers of tissue-engineered heart valves because it can guide them in further development of the interventions. However, it also helps clinicians and healthcare payers in identifying promising applications of tissue-engineered heart valves, which may results in faster take-up in clinical practice and reimbursement by healthcare payers. The authors acknowledge the support from the Netherlands Cardio Vascular Research Initiative: The Dutch Heart Foundation, Dutch Federation of University Medical Centers, the Netherlands Organization for Health Research and Development and the Royal Netherlands Academy of Sciences.
. The effect of population aging on health expenditure growth: a critical review. Eur J Ageing 2013;10:353–61.
. When should decision-analytic modeling be used in the economic evaluation of health care? Eur J Health Econom 2003;3:143.
. Conceptualizing a model a report of the ISPOR-SMDM modeling good research practices task force–2. Med Decis Mak 2012;32:678–89.
. The Delphi technique: making sense of consensus. Pract Assess Res Eval 2007;12:1–8.
. Transcatheter pulmonary valve replacement. Cardiol Therapy 2012;1:1–14.
. Van kosten tot effecten: een handleiding voor economische evaluatiestudies in de gezondheidszorg. Elsevier Gezondheidszorg, 2010.
. Modeling using discrete event simulation a report of the ISPOR-SMDM Modeling Good Research Practices Task Force—4. Med. Decis Mak 2012;32:701–11.
. Perspective on the cost-effectiveness of transapical aortic valve implantation in high-risk patients: outcomes of a decision-analytic model. Ann Cardiothoracic Surg 2012;1:145–55. , et al. Transcatheter aortic valve implantation for the treatment of severe aortic valve stenosis in inoperable patients under the Perspective of the Brazilian Supplemental health system—cost-effectiveness analysis. Rev Bras Cardiologia Invasia 2013;21:213–20. Report to Scottish Health Technologies Group (SHTG). Evidence Development Pilot Project: Transcatheter Aortic Valve Implantation in Scotland, 2010. http://www.gla.ac.uk/media/media_218806_en.pdf (accessed Oct 2016).
. Investing in new medical technologies: a decision framework. J Commercial Biotechnol 2007;13:263–71. Funding The study was supported by the Netherlands Cardio Vascular Research Initiative (CVON).